Known as the universal solvent, without water life on Earth would not exist. Right now, deep space probes are searching the far reaches of our solar system for water while three quarters of our own planet is bathed in it. Every living cell contains water. Every living plant depends on it to thrive. This book is about water. How to manage it, infuse it with the nutrition vital to plants and deliver it to their thirsty roots. In nature, fire and water act together to recharge the soil with nutrients. When forests burn, wood is turned to ash. Wood ash is rich in Potassium, one of the plant kingdom's fundamental foods. When the rains come, lifeless leaves and fallen branches are helped along their path to decay. Animals and insects hasten this process by their consumption of plants and excretion of organic wastes. roots. For a plant to receive a well balanced diet, everything in nature must be in perfect harmony. Forests must burn, animals must eat, rains must come, wood must rot, microbes in the soil must work. Rarely, if ever, can you find such ideal conditions occurring on a regular basis. In fact, Earth's rainforests may be the only examples left of near perfect botanical conditions. Visit one if you ever get the chance. 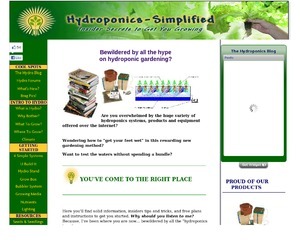 Hydroponics is about enriching water with the very same nutrient salts as found in nature. 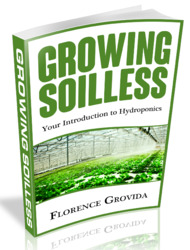 It is about creating and maintaining a "nutrient solution" that is perfectly balanced for your plants. Most hydroponic systems contain the nutrient solution and protect it from evaporating and from discharging into our environment unlike the runoff from exposed, fertilized soil. 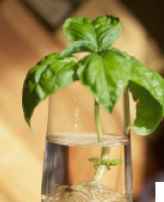 This conservative approach to water management is what makes hydroponics the method of choice in drought stricken area worldwide and as a result is rapidly becoming known as "Earth Friendly Gardening." Since you will be practicing the art of "water gardening", it is a wise idea to know what your local water contains. This can be done by calling your water company and asking for an analysis. If your water comes from a well, you will most likely have to send it out to a lab for analysis. The most important factor affesting water quality is the "hardness" or "softness" of the water. Hard water means that there is alot of dissolved mineral content, primarily calcium carbonate which usually shows up as scale on hot water pipes. Soft water is generally very pure or low in dissolved solids. Distilled or water that has been through a reverse osmosis filter would be considered soft. There exists on the market a number of nutrient formulations that are specific for hard or soft water applications. It is a good idea to keep this in mind when purchasing or mixing up your own nutrients.